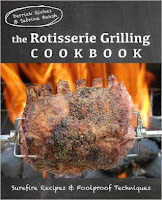 While you can grill a burger or steak without a cookbook, rotisserie grilling is tricky. With everyday grilling, most people cook things with roughly even thickness and they can tell when the meats are done just by looking at them. Try something bigger, like a leg of lamb, a whole turkey, or a full pork shoulder, and they have a problem--most grills will completely char the outside long before the inside is cooked to a safe temperature. The solution, of course, is a rotisserie. 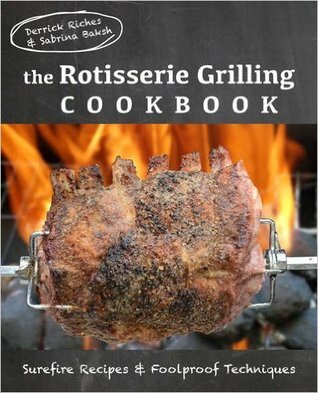 The Rotisserie Grilling Cookbook shows how to set up, maintain, use and troubleshoot a rotisserie spit. It includes 105 recipes will expand your outdoor cooking repertoire, including a dry-brined Thanksgiving turkey, a whole country ham for other holidays, a whole chicken, duck, game hens, and big cuts like a beef ribeye roast or a leg of lamb. Beyond the meat recipes that are the core of the book, it includes rubs, glazes, and mops that are specifically crafted for long, slow cooking over a rotisserie, and even some ideas, like a spit-roasted whole pineapple, from beyond the world of poultry and meats.